Mike Abbott has been running greenwood courses since 1985, initially near Bristol, then in Devon, and since 1995, in Herefordshire at Clissett Wood then Brookhouse Wood. With each move, Mike has taken the opportunity to refine the content and format of the courses and to improve the facilities based to a large extent on feedback from students https://goingwiththegrain.org/course-feedback/. 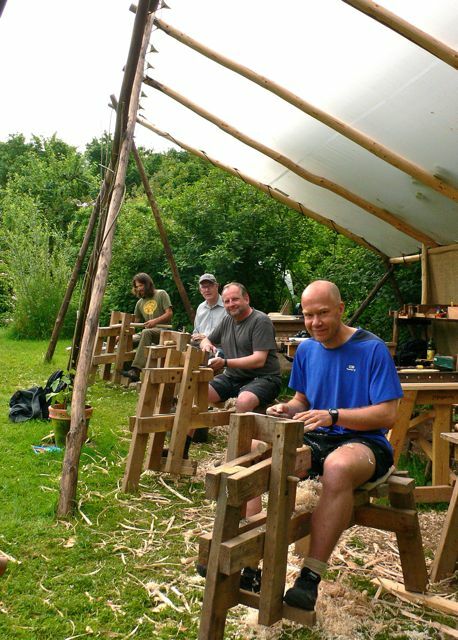 Over the years, Mike has found that of all the green woodworking projects he has offered, it is the making of a chair that has proved most popular and rewarding for course participants. Having reached retirement age in 2016, Mike moved these chair-making courses from the woodland back to the workshop in his cottage garden. It is what he does best and he still loves doing it! All courses run for 5 days and are limited to four students. All necessary tools, equipment and green wood will be provided but you are welcome to bring your own. The 5-day course costs £480, which includes ash logs plus seating materials, as well as hot drinks and a light lunch. We ask for £100 deposit with your booking, the remainder being payable a month before the course starts. For those who have not been on a greenwood chair-making course before, you are advised to keep to the most straightforward design, which is a spindle-back chair, although there is a range of options for the woven seat. Courses run from 9am to 6pm each day with about an hour’s break at lunchtime during which Mike can take his 20-minute ‘siesta’. 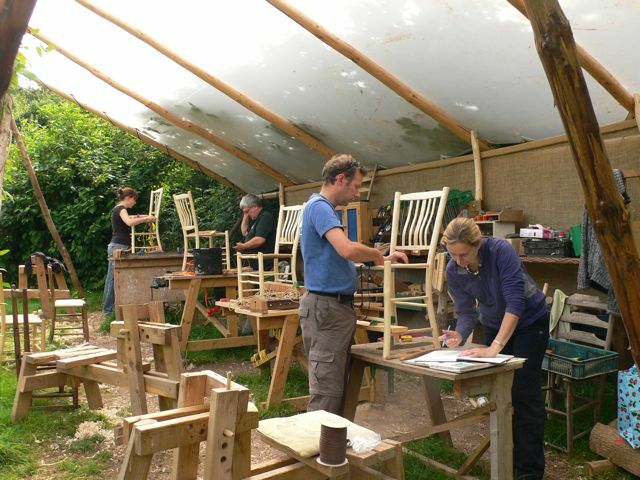 For those of you who already have experience in making greenwood chairs, the follow-on courses enable you to try your hand at a wider range of chairs, such as lath-backs, ladder-backs, settin’ chairs and wee-wors. The schedule will be similar to that of the spindle-back courses but you will have a greater chance to tailor your progress to your individual project. Currently all this year’s courses appear to be fully booked. However, we are bound to receive some cancellations, so if you are interested in a course, please send us an e-mail giving any dates that are suitable for you and we’ll get back to you to let you know if any dates have become available, or failing that, we can put you onto a waiting list. Greenwood Cottage is located in the hamlet of Halmonds Frome, about a mile from the centre of the village of Bishops Frome in East Herefordshire, midway between the cities of Hereford and Worcester.